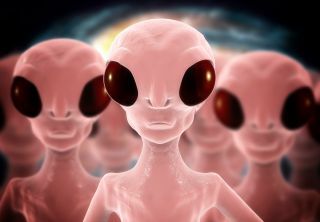 If mankind is destined to meet aliens, we are probably also destined to destroy them (according to one Russian physicist). "What if," Berezin wrote in a new paper posted March 27 to the preprint journal arxiv.org,"the first life that reaches interstellar travel capability necessarily eradicates all competition to fuel its own expansion?" In other words, could humanity's quest to discover intelligent life be directly responsible for obliterating that life outright? What if we are, unwittingly, the universe's bad guys? In the paper, Berezin called this answer to Fermi's paradox the "first in, last out" solution. Understanding it requires narrowing down the parameters of what makes "intelligent life" in the first place, Berezin wrote. For starters, it doesn't really matter what alien life looks like; it could be a biological organism like humans, a superintelligent AI or even some sort of planet-size hive mind, he said. Here's the catch: For a civilization to reach a point where it could effectively communicate across solar systems, it'd have to be on a path of unrestricted growth and expansion, Berezin wrote. And to walk this path, you'd have to step on a lot of lesser life-forms. "I am not suggesting that a highly developed civilization would consciously wipe out other lifeforms," Berezin wrote. "Most likely, they simply won't notice, the same way a construction crew demolishes an anthill to build real estate because they lack incentive to protect it." For example, a rogue AI's unrestricted drive for growth could lead it to populate the entire galaxy with clones of itself, "turning every solar system into a supercomputer," Berezin said. Looking for a motive in the AI's hostile takeover is useless, Berezin said — "all that matters is that it can [do it]." The bad news for humans isn't that we might have to face off against a power-crazed race of intelligent beings. The bad news is, we might be that race. "We are the first to arrive at the [interstellar] stage," Berezin speculated, "and, most likely, will be the last to leave." Stopping humans from accidentally obliterating all rival life-forms would require a total culture shift spurred by "forces far stronger than the free will of individuals," Berezin wrote. Given our species' impressive talent for expansion, however, such forces could be hard to muster. "I certainly hope I am wrong," Berezin wrote. "The only way to find out is to continue exploring the universe and searching for alien life."